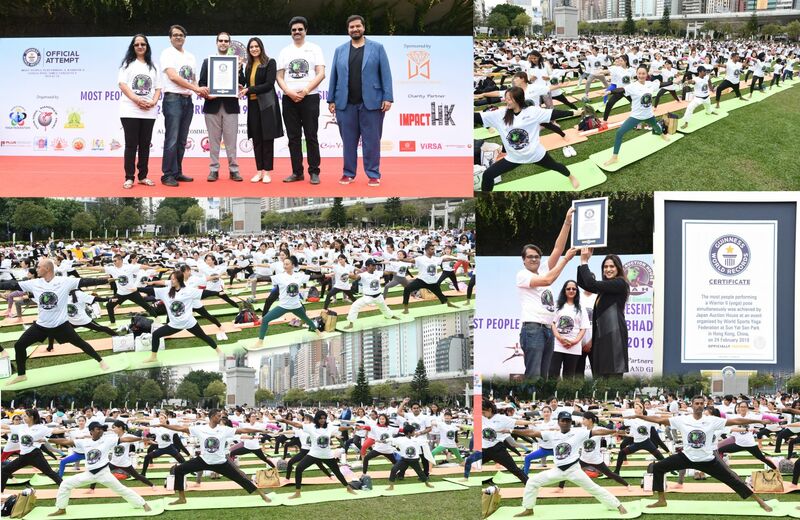 Taking the Yoga Day initiative of Prime Minister Narendra Modi to the next level, the Overseas President of BJP for Hong Kong & China, Sohan Goenka conducted a Japan Auction House Guinness World Record in Yoga. The first of its kind in the history of Hong Kong; beating the previous record of 387, more than 1011 yoga practitioners attempted Virabathrasan (Warrior II Pose) for 3 minutes in one place and achieved the Guinness World Record at Sun Yat Sen Memorial Park, Hong Kong on 24th February. Patron, World Sports Yoga Federation Sohan Goenka organizer of the event said, aiming to contribute to the commendable initiative of PM Narendra Modi, we intend to make the whole world understand the unifying force of Yoga. Sohan Goenka, President, OFBJP (Hong Kong Χna), Patron, World sports Yoga Federation & Chairman Unirich Jewellery Ltd organised and witnessed the event as a Chief Guest & Anup kumar Agrawal (Chairman Japan Auction House was the Guest of honour to this historic event. Hon. Regina Ip GBS, JP (Member of Executive Council and Chairperson of New People's Party), Mr Lai Tung-Kwok GBS, IDSM, JP (Former Secretary for Security), Ms. Judy Chan (District Councillor), Smt Mrinalini Srivastava (Acting Indian Consul General),Mr Narayan Singh (Indian Council, HOC, EDU & Culture), Mr. Maneesh Kumar (Consul Economic) also witnessed the historic World Record in Yoga. This was a charity event sponsored by Mr Anup Agarwal, Chairman of Japan Auction House - A member of Goenka Group which was established in 1953 in specialising Diamonds, Precious Gems & Jewellery business following father’s footsteps. Sohan Goenka established their International Business Model around 4 decades ago in Hong Kong. They have generously sponsored the entire event, providing a location and a platform for each of the 1500 volunteers to receive a free yoga mat and Guinness world record t-shirt and an opportunity to earn an official Guinness world record certificate on their own individual name.